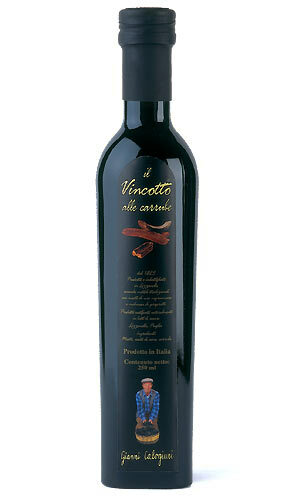 Vincotto Balsamico is a versatile condiment, it can be used with rice, soup, meat, fish, cheese, salads and fruits. Ideal with ice creams and desserts. Juice from selected Carobs infused in a barrel aged cooked grape must from Negroamaro and Malvasia Nera grapes and Red Wine Vinegar from Negroamaro grapes. 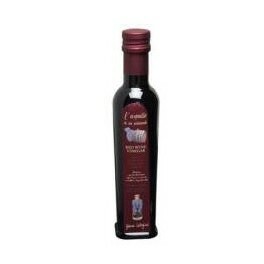 Perfect as a condiment for bresaola carpaccio, dried fruits, vegetables raw and cooked, fruits, sorbets and ice creams. 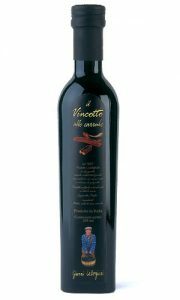 The Gianni Calogiuri Red Wine Vinegar is produced by the method of fermentation and subsequent slow acidification in small oak barrels. This process allows the natural transformation of red wine in red wine vinegar. The regularity of this process converts only the ethyl alcohol into acetic acid while leaving all other components of the wine characteristics. The vinegar thanks to this slow transformation and maturation in the barrels acquires more and more perfume and aroma.